On Late Night with Seth Meyers, Evans talked about how close he is with his parents. By Rebecca Sirull·	 4/7/2017, 10:36 a.m. He may spend his on-screen days punching aliens and beating up bad guys, but in real life, Captain America is just a big mama’s boy. 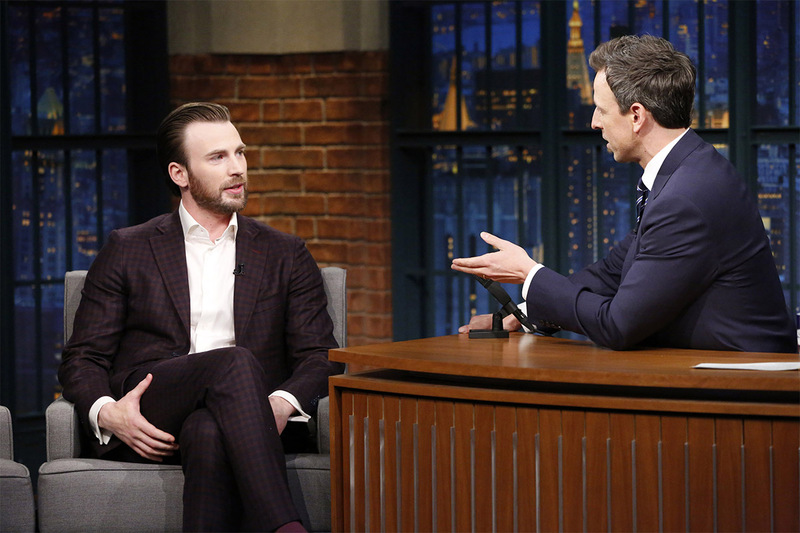 Chris Evans, who’s played the iconic Marvel superhero in five movies, with another currently in production, went on Late Night with Seth Meyers to talk about his upcoming film Gifted, and ended up gushing about his close relationship with his mom and how he used to cry all the time as a youngster. The two men both bonded about being part of tight-knit families and not wanting to stray too far from home when they were younger. Evans confessed that he cried on the first day of school right up until fourth grade, when he patted himself on the back for getting on the bus tear-free. But thankfully, he always had his mom to turn to for support, and apparently so did his friends. In fact, Evans is so tight with his mom, he even told her when he lost his virginity. Gifted sees Evans co-starring opposite 10-year-old McKenna Grace, who plays his hyper-intelligent niece, and who, according to Evans, is just as mature in real life.